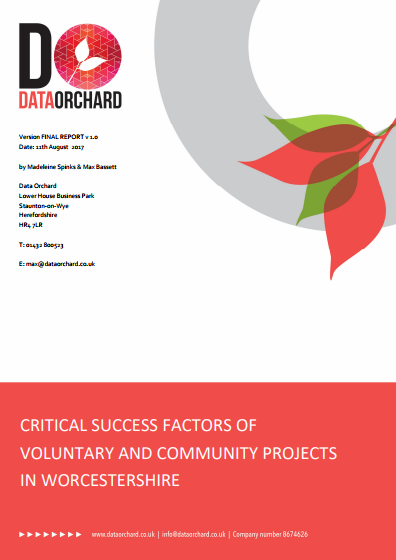 In March 2017 Data Orchard was commissioned by Worcestershire Voices to undertake research into the critical factors in making a voluntary and community project a success; and whether these can be replicated across Worcestershire. The survey to identify successful voluntary and community projects in Worcestershire yielded details of 15 projects, with a good range by project type and beneficiaries. Six were explored in more detail through interviews and seven people engaged in a workshop with a further three afterwards. adequately resourced (money, people, time). Both to setup initially, to establish and then to continue operating. The critical success factors were considered by all to be mostly self-generated (i.e. within the organisation); with the exception of being adequately resourced where skills and funding can be found outside the group or project. It was also recognised there is a lot support and guidance available for governance and compliance but it still needs to be self-managed. Utilising the right skills can also be out-sourced.